Proficient with business software such as Microsoft Office - particularly Word and Excel. Ideally have previous experience in a similar busy environment. Previous sales experience is preferred but not essential. However you will need to have a genuine interest and knowledge of Motorhomes. The successful applicant will join a very effective Sales Department, helping assist with the selling and demonstrating of a wide range of New and Used Motorhomes. Weekend working is essential. The successful applicant will join a very effective Sales Department, selling a wide range of both new and used Motorhomes and Caravans. Although mostly based at Highbridge you will also be representing the Company at various exhibitions throughout the Country ensuring exceptional customer service at all times. Ideally you would have previously worked within the industry or have experience in a similar busy sales environment. Previous sales experience as well as excellent communication skills are essential. 5 day working day week. Weekend working is essential however there is the option for taking one weekend off per month on a rota basis. Full driver's licence is required. Will be required to work to high standards on customers' vehicles. Working on the mechanical, LPG and electrical side of Touring Caravans and Motorhomes. Although mostly based at Highbridge you will also be required to undertake work on customers' vehicles either at their homes or campsite. Experience in a workshop environment and proven technical ability is essential. The opportunity to take a City & Guilds in Caravan servicing, an LPG and industry electrical qualifications are available as well as various product knowledge courses throughout the year. 40 hour working week with optional overtime when available. Seasonal Shop Assistant to join our team of helpful and friendly staff within our busy shop. The ideal candidate will enjoy working in a customer facing role, and will have a genuine interest in outdoor leisure. This position will require you to work alongside our busy parts and Aftersales departments being responsible for all goods in from manufacturers and out to the technicians and the customers. Also being responsible for sending all warranty parts back to the manufacturers. Will also be required to cover the parts counter serving customer with their parts enquiries for holiday cover and when necessary. Monday to Friday working and will require alternate Saturday morning working. Will be required to work to high standards on customers' vehicles. Would suit someone with carpentry experience. Will involve repairing and replacing internal woodwork, external panels, and fitting canopies, bike racks, etc. 40 hours working and optional overtime available when required. An excellent opportunity for an enthusiastic person to work alongside a successful IT and Website Department. Main responsibilities will be taking photography and 360 degree images, for uploading to the company website, using in-house software. The job also entails scanning brochures in for the website and opportunities for video work. In addition to this, you will be expected to help with general duties such as data entry, help desk support and assist with the company website, social media and online shop. The successful applicant will join our After Sales Department. The applicant will be required to assist our customers both over the phone, face to face and by email. General administration will include filing, & scanning . Must have excellent communication and organisational skills and be computer literate. Previous reception experience is essential as well as the ability to work well within a busy environment. Previous work within our industry or the motor industry would be advantageous. Monday to Friday and will require alternate Saturday morning working essential. Maintaining a manual cashbook, dealing with petty cash, balancing the monthly sales book and checking sold and redeemed vouchers. Plus other adhoc duties especially at month end. Previous sales experience is preferred but not essential. However you will need to have a genuine interest and knowledge of Caravans. The successful applicant will join a very effective Sales Department, helping assist with the selling and demonstrating of a wide range of New and Used Caravans. Weekend working is essential. 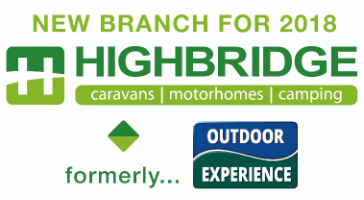 Alternatively: you can email your CV and application form to jobs@highbridgecaravans.co.uk, or deliver your application form in person at either branch. Application forms are also available from Highbridge's Sales Office, click here for Directions. Please note if you have not heard within 4 weeks of submitting your Application, unfortunately you have been unsuccessful. Seasonal positions are for immediate start until the end of September. Salaries will be discussed at interview.